Baja Wines at San Diego’s ¡LATIN FOOD FEST! I recently attended the ¡LATIN FOOD FEST! in San Diego, a four day event featuring Latin culinary personalities as well as wine, beer, and spirit producers. This was the first of a multi-city event. (The next ¡LATIN FOOD FEST! will be in Miami starting March 22, 2014.) I purchased tickets to the ¡LATIN FOOD FEST! Grand Tasting and I was also invited by DIÁLOGO, the producers of the event, to attend the Fest Kick-Off Party. Wines from the Baja California Mexico region have recently begun to gain recognition, so I was excited to meet some of the wine makers and taste some Baja wines. AlXimia is a boutique winery owned by a family of scientists. AlXimia is a play on the Spanish word for alchemy, the scientific attempt of the Middle Ages to turn ordinary metals into gold. As scientists, the family is turning the natural elements into something better than gold, wine. Alvaro Alvarez is the founder and winemaker, and his brothers and parents have various roles in the family business. I met with Manuel, the brother in charge of sales and marketing, after the ¡LATIN FOOD FEST!, which allowed me to learn a lot more about the winery and wines. The wines are named for the elements fire, air, water and earth. Most of their wines are blends. The blends all start with a mixture of Petit Verdot and Zinfandel. The additional grapes make the difference between the wines. Petit Verdot, Carignan, Barbera, and Zinfandel grapes are grown in the AlXimia vineyards, which were planted in 2003. They also buy grapes of 15 to 30 year old vines from other vineyards in the three Baja wine valleys. Some of AlXimia’s elemental wines. I was able to taste four of AlXimia’s wines. My favorite was the Sendero, which means path in Spanish and corresponds with the earth element. Sendero is a blend of Petit Verdot, Zinfandel, Cabernet Sauvignon, and Tempranillo. It was a very bold and complex wine with fruit and berry flavors. The wine can be paired with red meat, cheese, chocolate, mole, and pastas. My second favorite was Aura, water element, a blend of Petit Verdot, Zinfandel, and Grenache. This wine was lighter and fruitier and would be good on a hot day when a heartier wine would be too much. It can be paired with cheese, pasta, and seafood. I also enjoyed Magma, elements earth and fire, which is a blend of Carignan and Sangiovese. It can be paired with beef, lamb, deer, and spicy stews. Pira, element fire, made of 100% Barbera, was not to my personal taste. It had a very strong, intense one-note flavor. I imagine it would be better served with hearty meats, rather than on its own, and can be paired with goat, carnitas, deer, rabbit, and venison. The AlXimia winery in Valle de Guadalupe is a new building with a unique design. It has the form of a spaceship on the outside and is like a cathedral to wine on the inside. The design is not only visually pleasing, but also allows the winery to be eco-friendly. The shape of the roof allows for rain water to be captured for irrigation use. The multiple roof levels, concrete building, and insulation of casings filled with cement and the dirt from the building area keep the winery cool without the use of air conditioning. The cavernous interior allows for various phases of wine production to occur on different levels, with de-stemming on the top floor, fermentation on the second floor, and the barrel room on the lowest floor, which is underground, all allowing for the use of gravity to assist with the process, rather than a lot of electricity using machinery. A visit to the winery will allow you to see the entire process. The tasting room is currently open from 11:00 a.m. to 6:00 p.m. on Saturday and Sunday. AlXimia has just recently started exporting their wine to the United States and five of their eight labels are available in the States. They also have a wine club that is available to their neighbors north of the border, which not many Baja wineries offer. AlXimia is working on having their wines available in stores and restaurants in the States, but they currently are only available at Jonathan’s Market in La Jolla, California, and they are more interested in attracting visitors to the winery. AlXimia wines are available throughout Mexico. Manuel has also organized a three-day Valle de Guadalupe wine and culinary adventure in October for those who would like to experience Baja’s wine country in a group tour setting. More information can be found at La Neta Adventures’ Facebook page, and more tours will be planned. Joe and Rachel Malagon own Vinedos Malagon in Ensenada, Baja California Mexico. Vinedos Malagon was originally a ranch in the early 1900s and has vineyards dating back to the 1960s, which is unusual for the region as many of the vines are far newer. Joe and Rachel purchased the vineyard in 2000 and began making wine in 2005. Something else that makes Vinedos Malagon unique is their wines are estate wines, meaning they only use their own grapes and do everything in-house, including growing, producing, and bottling. Their main varietal is 55 year “old vine” Grenache, and their signature wines, Equua and Malagon Reserva de Familia, are blends. They also have El Grenache, which is 100% old vine Grenache. At the ¡LATIN FOOD FEST! Kick-Off Party I had a chance to taste the Equua. I really enjoyed the Equua, which is a blend of Grenache and Petite Sirah with a full, bold taste. 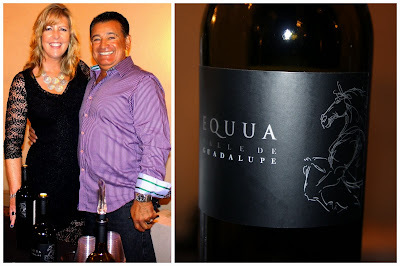 Joe and Rachel of Vinedos Malagon and their wine Equua. Vinedos Malagon has a tasting room open Wednesday through Sunday from 11:00 a.m. to 4:00 p.m. They also have a four room bed & breakfast. More information can be found on their website or obtained by email. Their wine is available throughout the mainland of Mexico and is sold at local wine stores in Ensenada and Mexicali and served at restaurants throughout the Valle de Guadalupe. In the United States, their wine is served at one of my favorite restaurants, Romesco’s in Bonita, California. It can also be found in San Diego at Beckman Wine & Spirits or the Wine Bank, in San Clemente at San Clemente Wine Co. and Bob’s Fine Wines, and in Los Angeles at Beso Hollywood, Wally’s Wines, K&L Wine Merchants, and some restaurants. Phil Gregory had been making wine for just over four years when he began Vena Cava in 2007. As you may have guessed from his name, he is not originally from Mexico. He actually hails from Manchester, England. 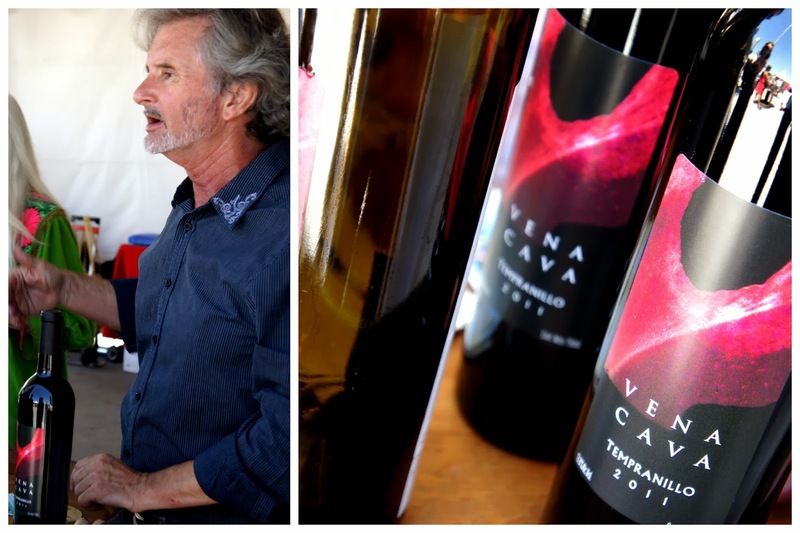 Vena Cava’s wines include Cabernet Sauvignon, Tempranillo, a Cabernet Sauvignon and Grenache blend, a Reserve blend of Cabernet Sauvignon and Syrah, and Sauvignon Blanc. The Valle de Guadalupe does not get much water, which stresses the vines, so Phil uses a gentle hand when making wine from his grapes. Phil believes wines should be easy to drink and should pair well with food, transferring from one course to another without having to change wines. Winemaker Phil Gregory and Vena Cava’s Tempranillo. At the ¡LATIN FOOD FEST! Grand Tasting I was able to taste the Tempranillo and Cabernet Sauvignon, both of which I enjoyed. The Tempranillo was refreshing with notes of cherry and very easy to drink. It is recommended to be paired with paella, seafood, and chicken. The Cabernet Sauvignon was a more complex and heartier wine with spice and berry notes. It can be paired with meats, stews, mole, pork, and pastas with cream sauces. Even though the wine was being served in plastic cups, as the event was held outside at San Diego’s Broadway Pier, the Cabernet’s legs were still apparent. Vena Cava’s tasting room is in a beautiful and unique building with an overturned boat as a roof. In addition to the tasting room, Vena Cava also has a six room bed & breakfast as well as a restaurant which was just listed as number 30 in the top 50 restaurants in all of Latin America. On this side of the border, Vena Cava’s wines are served at Romesco’s in Bonita. Some other excellent wines I had at the ¡LATIN FOOD FEST! were Cava Aragon 126 Madera 5 Tempranillo Cabernet and Atrevida Malbec. While in the recent past Baja wines did not have much of a reputation, they are quickly becoming contenders in the wine scene. The Valle de Guadalupe in Baja California Mexico is becoming a popular destination for wine lovers. There are many wineries to visit, and even a wine museum, Museo de la Vid y el Vino where you can pick up a map of the wineries in the region.